Octopre MkII is the new solution for expanding your recording system. It consists of eight Focusrite mic-pres and a built in 24bit/96khz AD..
Octopre MkII is the new solution for expanding your recording system. 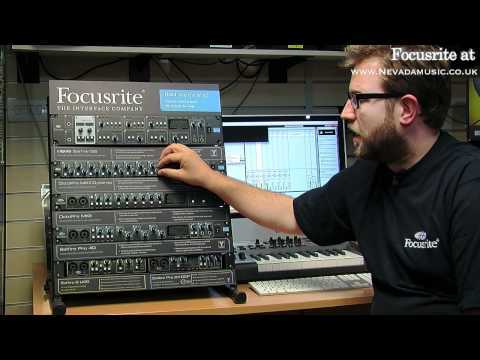 It consists of eight Focusrite mic-pres and a built in 24bit/96khz ADAT output - ideal for making use of often neglected ADAT inputs on soundcards, digital desks and Pro Tools hardware. It is also great for live use as it has eight analogue line-outs where you can use the mic-pres, send lines out to individual channels on your mixer, leaving the ADAT outs free to route to a hard disk recorder. The Focusrite OctoPre MkII Preamp is a powerful input upgrade for your Pro Tools system. With 8 channels of Focusrite pre-amplification and a built-in 24-bit/96 kHz ADAT output, the OctoPre MK II is suitable for any digital audio workstation. It's also a great expansion for any analogue or digital console, or for your hard disk recorder. The OctoPre MkII preamp's digital output makes the most of often-neglected ADAT inputs”ideal for expanding the number of mic-pre inputs on your interface. Connect OctoPre MkII to your audio interface's ADAT input to create a high quality, multi-channel recording solution. Focusrite OctoPre MkII is also an ideal preamp for tracking drums, as well guitars, keyboards, vocals, and more. PMT Buying Guide: Do I Need A Mic Pre-Amp?